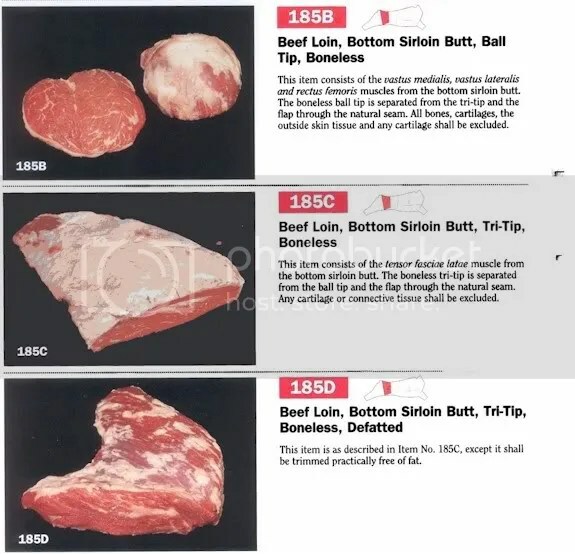 A tri-tip is a cut of beef from just below the bottom sirloin, usually about a 3 lbs cut. The tri-tip used in this recipe was 4 lbs. This cut first became popular in Santa Maria, CA. If you want to use a pre-marinated tri-tip, or this cut is not available in your local area, you can not go wrong with Harris Ranch Santa Maria Tri Tip. If you buy a tri-tip that is not seasoned, I have used a rub that is 1/2 Dizzy Dust All-Purpose Rub and 1/2 Big Green Egg Gourmet Seasoning. 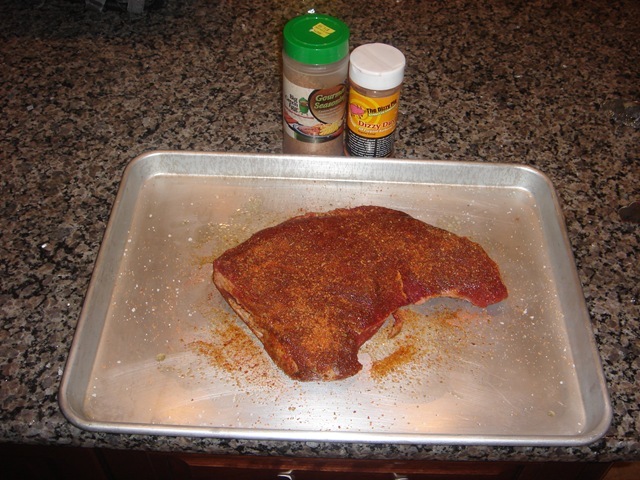 Cover tri-tip with rub, place in a Ziploc bag and refrigerate overnight. Remove from refrigerator about 2 hours before grilling. Setup the BGE for direct cooking and get the temperature to about 600. Grill the tri-tip for 3 minuets per side, then remove from the BGE, and cover with foil. Let the BGE cool down to 350, and setup for indirect cooking. 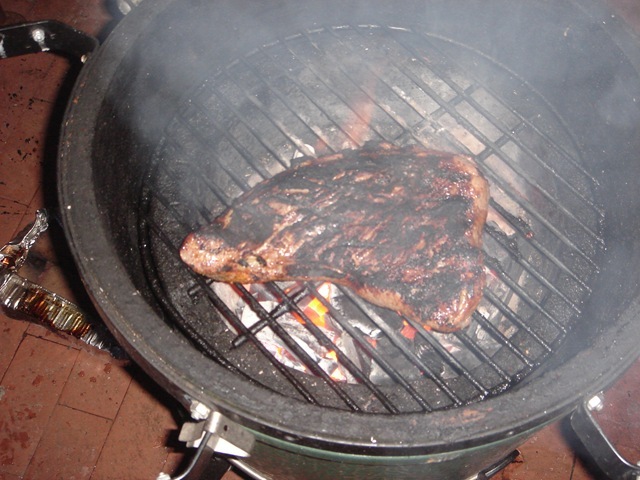 Place the tri-tip back on the BGE for approximately 30 to 45 minuets, or until the internal temperature is 125 to130, this will result yield medium rare. 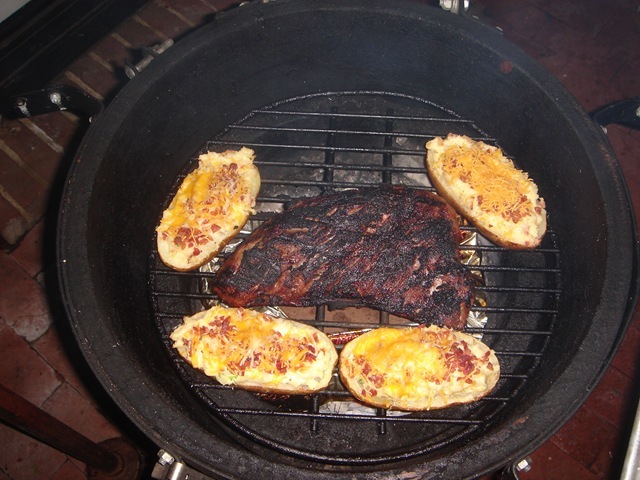 Note: the picture shows the tri-tip on the BGE along with twice-baked potatoes. Remove the tri-tip allow to sit for 10 minuets before carving. When carving a tri-tip you want to cut across the grain and cut small slices, approximately 1/4 inch, or thinner if using for sandwiches. I am a fan of your blog already. You do know I hope that red meat is GOOD for you. gryphonscry – Hope you like this. 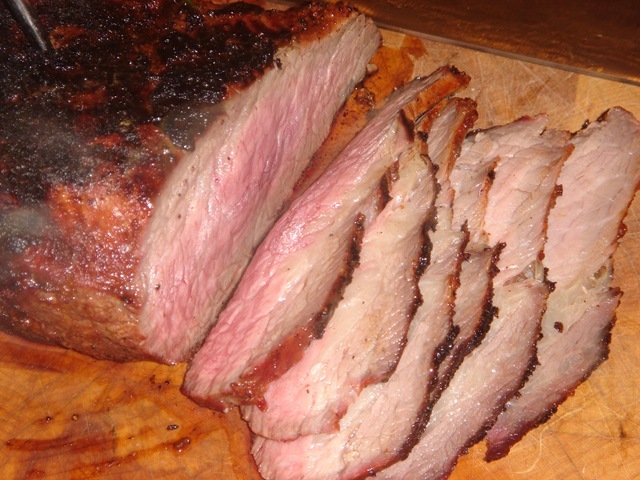 Tri tip is a great cut of meat and very affordable. Why can’t I find tri-tip in Houston Texas??? Had in California and it was GREAT!! We live in Houston and a friend from Utah turned us on to tri-tip and believe it or not we found it at Costco !